Playing quidditch is awesome, not only for it's Harry Pottery goodness but for the amalgam of sports it sprouts from. Quidditch is dodgeball, soccer and rugby all mixed together in one magical potion(I just had to say it). It's a great workout and the different positions allow for endless fun and merriment. The rules are taken from the books— with adjustments made for the fact that we muggles can't fly. 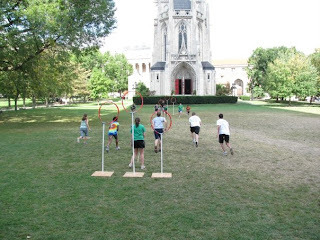 If you ever have a chance, play some Quidditch!